Facebook is an online social media tool for users to connect with people and share moments. Sometimes you may come across an amazing video on Facebook and look for a way to save it to your own devices. However, Facebook doesn’t provide a built-in download feature to let you do that. That being said, there are still ways to do it. Here I’m going to introduce you several useful Facebook video downloader tools: Facebook video downloader for PC, Mac, Android, iPhone, Chrome & plugin. With these tools, downloading Facebook video is just a job of seconds. Without further ado, below are our 5 recommendations for downloading videos from Facebook for free. Here is the list of 5 best ways to download Facebook videos in 2019. Facebook is a must-have social media site for many people on the world, because it has plenty of video contents in various types, and one can share & discover interesting video clips, music videos, movies etc. However, Facebook does not provide a direct passage to download these videos to your computer or other devices for offline playback. So, what can we do to deal with this problem? If you want to download videos from Facebook to Windows computer, Gihosoft TubeGet can be a good choice. It’s developed to download videos from YouTube as well as Facebook, Twitter, Vimeo, Dailymotion, Metacafe, Break and more. 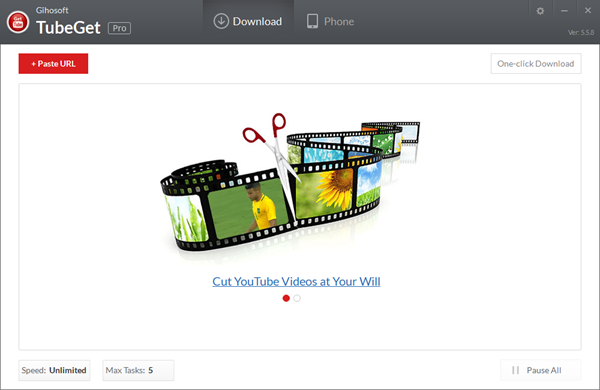 Besides, TubeGet can also act as a great Facebook video downloader for Mac if you have a Mac computer. And another good thing about this desktop video downloader is that it keeps updating and improving its features, so it will never fail to work unexpectedly. Go to the Facebook website, and you will see a News Feed page if you’re logged in. If you aren’t logged in, enter your email address and password in the top-right corner of the page and click Log in. Scroll through your News Feed until you find the video. Right click on the Facebook video and select “Show video URL”, then you will see the URL box, just copy it. Run Gihosoft TubeGet and click “+Paste URL”, it will start to analyze the URL. After parsing, it will pop up a dialog box for you to set the output video resolution and save path. Press “Download”. Depending on the total number of downloading video files and their size, the downloading process may take time. PC users always have a lot of options while mobile users get less, but we use Facebook more frequently on smartphones than on computers. Therefore, you may be engaged in the search of a Facebook video downloader for Android or iPhone. There are many apps that claim to have the ability to download Facebook videos on Android or iPhone devices, but we haven’t had much luck with any of them. If you have no idea what’s the best app to save Facebook videos for offline watching, you can find a perfect solution here, a great app – TubeMate. With it, downloading Facebook videos on your Android phone is easy as pie. So here I will take Android as an example expounding you how to download videos from Facebook to mobile devices. Download TubeMate from its verified sites such as Uptodown or SlideME. 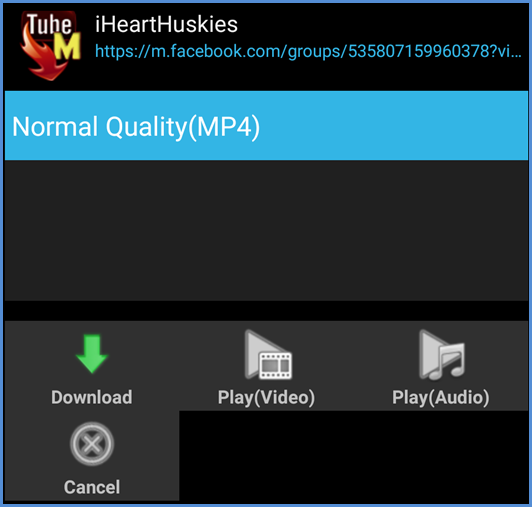 You can’t download TubeMate from Google Play, because TubeMate has the feature to download YouTube videos, so it’s not allowed to be put in the store. 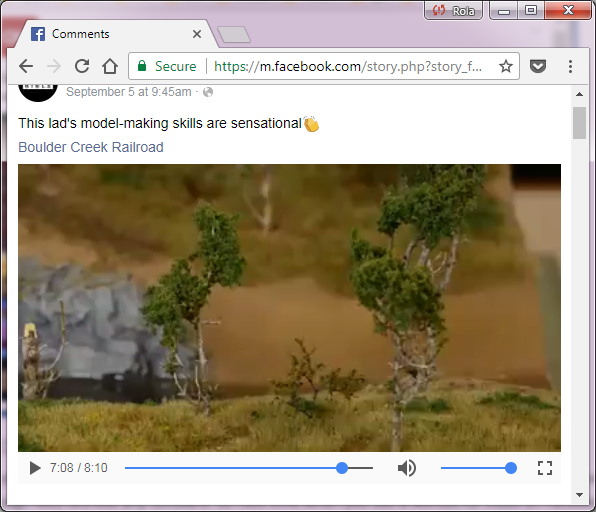 Open TubeMate, paste the link of your Facebook video and click the green download arrow, then a new interface will pop up for you to select the video quality. Click the ‘Download’ button, and you just sit tight to let the full process completed. Tips: If you want to download videos from Facebook to iPhone, you can try Video Downloader Super Lite. It’s an IOS app that allows you to download videos from tons of different online video sites directly to your iPhone/iPad, Facebook is also included. Facebook hosts a large number of unique videos that you will not find on YouTube, Vimeo or other video hosting sites. But when it comes to downloading the videos posted on Facebook by other users, it’s not always as easy as just tapping and saving directly from within the app, for it doesn’t have a direct download feature. But with the right straw, one can make great bricks. Now I’m going to show you an actual way to grab Facebook videos offline – using an online website – GetfVid. GetfVid is a free online web application designed to download videos from Facebook without registration. The downloading steps are very simple, all you need to do is pasting the URL in the box and choose to download the video in a high definition format or a standard format. On top of that, it’s also equipped to download facebook private videos. To do this, check out this guide below. To start with, first go to the Facebook video page, right click on the page and choose the option “View Page Source”, copy the complete Page Source. Paste the copied content into the box on the GetfVid Facebook Private Video Downloader interface. Click the “Download” button and it will skip to another page. On this page, you can choose to download the video in high definition format or standard format, and choose the appropriate download directory. Now you will start to download the private Facebook videos to your computer. The social media loves to tell you how it never forgets anything, but it’s dancing with an Internet connection. If the Internet connection is down, so does the content we keep on it. And there is also the danger that videos will be taken offline the next day as the video creator may delete them or keep them private. Sometimes it’s a good idea to download your favorite videos from Facebook, either for keepsakes or for sharing them with your friends. Downloading Facebook videos online with website is pretty cool, it’s also quite user-friendly to a novice. There is also a very easy way to save videos from Facebook to your devices – trying an extension, which can make your Facebook offline experience a little bit better. For Chrome users, it’s a good idea to try FBDown Video Downloader, a stable and fast Chrome extension, and it’s guaranteed to work and work well. Now let’s get down to business and see how to use it. Go to Chrome Web Store and type in “FBDown Video Downloader” in the search box. Find the extension, then click “ADD TO CHROME” button to install this extension on your Chrome. Open Facebook and find your favorite video, play it on the page. If the plugin detects the video, then its icon will turn green. Now click the icon! Choose the video quality (Normal or HD) you like, then it will be directed to the download page. Click “Download your Video” and the Facebook video will be soon saved to your computer in a few seconds. When you see an interesting video on Facebook and want to download it for offline playback, but you just don’t want to install any software to fill extra space as you rarely use it. To solve this problem, you can turn to an online site or a plugin, like the way I show you on Part 3 and Part 4, which are easy to get started and work well. Aside from these two options, there is also a trick that can help to save Facebook videos without the use of any third-party software, script or online video downloading service. All you need is your browser, Google Chrome, Firefox, IE or other browsers are OK. If you are ready, let’s dive into the download work. To start with, first you need to find a video you want to download on Facebook, then right click on the video, select “Show video URL”. Copy the URL and open a new tab, then paste it into the new address bar. Replace the “www” with “m” and then press “Enter” button. The purpose of this operation is to redirect it to the mobile version of Facebook. A new interface will pop up, play the video on the screen, then right click the mouse and select “Save video as”. Rename the video and choose a saving directory, then click “Save” button to complete the download. As you see, you can easily save a video from Facebook to your computer or Android & iPhone with computer software, mobile app, browser & plugin. So next time when you see a wonderful video on Facebook, just download it using one of these methods and enjoy your video time. Now I want to turn it over to you: Which method do you like best? Let me know by leaving a quick comment below.